Jonathan Ginsberg of Atlanta has created a series of 10 podcasts on Social Security disability benefits available through his ssdRadio website. This is a very old story that might surprise even Michael Astrue, the nominee for Social Security Commissioner. According to Time magazine his father kept winning and winning on a television quiz show in 1959. Note that there are not that many Astrues in the world, that Mike Astrue was born on a military base in New Jersey in 1956 and that this James Astrue was in the Air Force serving in New Jersey at the time. Also, Michael Astrue's middle name is James. It has to be Michael Astrue's father. It is scary to think how much information will be available on the internet in another 30 or 40 years. The privacy implications are staggering. This information is trivial, but in the future our youthful indiscretions may be permanently recorded on the internet for anyone to quickly access. The U.S. Social Security Administration is looking to move workers from its Metro West campus in downtown Baltimore to a smaller office elsewhere in the city due to cutbacks in its work force. As many as 5,000 people once worked in the pair of connected buildings at 300 Greene St., but that number is below 2,000 now, said Mark Lassiter, spokesman for the Social Security Administration. In contrast to the 900,000-square-foot Metro West, the administration is now looking for property in the range of 525,000 square feet, with a capacity of about 1,900 workers. Social Security has posted two new forms to be used in its upcoming system for direct deposit of attorney fees. The first is SSA-1694, which is used to supply a taxpayer identification number for a business entity. The second is SSA-1699, by which an attorney would supply information about a professional association and provide direct deposit information. It is unclear whether the SSA-1699 would have to be filled just once or filed separately for each client. The SSA-1699 has one obvious problem. For the direct deposit information, the form says that "You must be the owner or co-owner of the account" and asks that you check to indicate whether you are. This is a problem for any attorney who works for a professional corporation or who works as an associate attorney anywhere. An associate attorney is an employee of a law firm, rather than a partner or princilpe who has an ownership interest. The form, as currently set up, would probably exclude most attorneys representing Social Security claimants, since most of them are either associate attorneys or attorneys who work for professional corporations. There are other places on the form that suggest confusion about law firm organization. The person filling out the form is asked to check one of two blocks. One is labeled "Sole proprietor or Single-Member LLC/LLP" and the other is "Partner or Salaried Employee." It makes no sense to distinguish between Single-Member and non-Single-Member professional corporations and there are many more designations for professional corporations than LLC and LLP. Also, partners and salaried employees are lumped together, but are rather different ecenomically. This form will have to be redone. Fortunately, this system will not be mandatory for some time. Jo Anne Barnhart, Social Security's Commissioner until January 2007, has made it clear that she expects major budget problems in the next fiscal year, which begins on October 1. She has predicted a hiring freeze plus the possibility of staff furloughs. Consistent with this has been a dramatic downturn in the number of open jobs advertised at SSA. The number of jobs advertised by SSA has been steadily decreasing in September and none had a closing date after the end of September -- until today. I had expected that SSA would soon be advertising no openings. However, Social Security has now advertised two jobs with a closing date in October. This may indicate a slight improvement in the budget picture or perhaps all it indicates is that even under a hiring freeze there will be a few critical positions filled. The two jobs advertised are for an air conditioner mechanic in California and an administrative specialist in Illinois. The position of Deputy Commissioner of Social Security is a presidential appointment that must be confirmed by the Senate. The job has been vacant since James Lockhart quit the job in April 2006 to go to OFHEO. President Bush has recently nominated a new Social Security Commissioner and new members to the Social Security Advisory Board, but not a new Deputy Commissioner for Social Security. Perhaps, Bush intends to allow Mike Astrue to pick his own Deputy Commissioner. Perhaps, Bush intends to put a career SSA employee in the job, which was the practice before Lockhart. Perhaps, Bush will use the Deputy job as a negotiating point in the Astrue confirmation process. In any case, the failure to nominate a Deputy Commissioner is interesting. Social Security has released its monthly statistical package for Title II and Title XVI. When Medicare mistakenly sent premium refunds to 230,000 people who had signed up for prescription drug coverage, the Bush administration said the error had resulted from a rare “computer glitch.” But government records and interviews with federal officials show it was the latest example of a strained, often dysfunctional relationship between two of the government’s biggest programs. Since the drug program began on Jan. 1, hundreds of thousands of beneficiaries have reported problems in getting the government to carry out their instructions to start or stop the withholding of premiums. Drug plans have repeatedly complained to Medicare officials that premiums have not been properly withheld and that beneficiaries have been upset. Social Security's Office of Inspector General (OIG) has issued a mostly complimentary report on Social Security's response to Hurricane Katrina.. In many ways, Social Security’s disability program is the epitome of bureaucracy. The sheer size, coupled with a complicated process and funding shortfalls, create what many applicants refer to as “a nightmare.” But even its harshest critics admit the system is struggling in part because of limited resources. Teri Lynn Mazonna was sentenced to a year and a day in federal prison for defrauding Social Security of $148,484 over 14 years, according to the Billings Gazette. What Kind Of Name Is Astrue? You really wanted to know, but were too politically correct to ask, but, come on, the Republicans are opposed to political correctness, so why not. Astrue is almost certainly a French name. Jean Astrue (or Astruc as the name is spelled in some sources) was an important French Biblical scholar of the 18th century according to this article from the Journal of the American Scientific Affiliation. Jean Astrue was also physican to the French king. The Empire Justice Center of Rochester, NY has released its Newsletter for September. It is an excellent summary of recent developments in Social Security law. LegisIT has posted online a large number of fillable Social Security forms in PDF format -- and they are free! 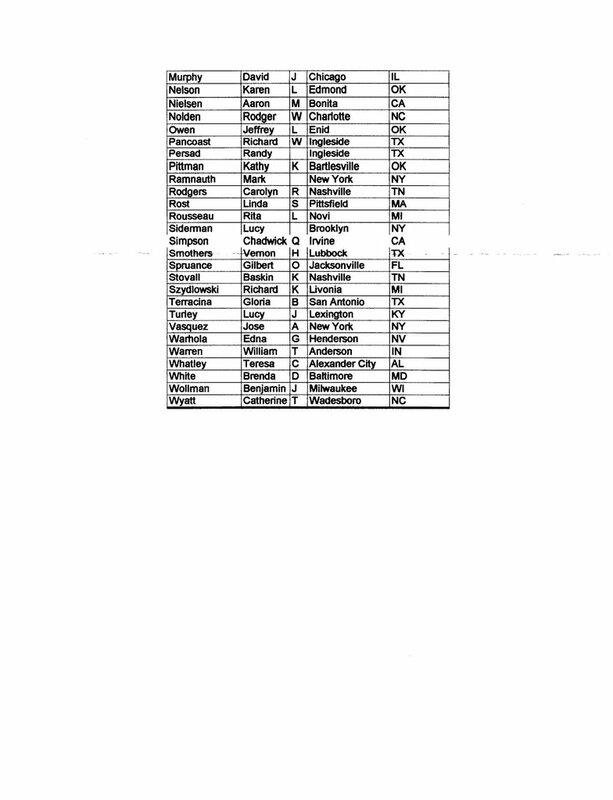 Newsmeat was kind enough to send me a complete list of Michael Astrue's recent political contributions. What I had posted before was a "filtered" list. I do not know if Newsmeat looks through web posting for references to their service or if someone there is interested in this appointment, but I certainly appreciate their help. I have found another source, CampaignMoney.com, that lists Michael Astrue's political contributions in 2005 and 2006. He appears to have been a bit more generous to local Republicans lately, but the contributions still seem quite low for someone seeking a political appointment. See below. The Social Security Advisory Board has finally released the agenda for its meeting this afternoon. After looking at it, you will wonder why I took so long to produce this. The Request for Information below was posted by the Social Security Administration. The purpose of this Request for Information (RFI) is to gather information on behalf of the Social Security Administration (SSA). SSA is investigating new ways for people to file applications for SSA Retirement and Disability benefits. Among the options being considered is a process to collect bulk data from third parties who wish to assist claimants filing for SSA and/or other types of benefits. The goal of this RFI is to solicit input from potential third party providers to determine the need for and feasibility of SSA building a web service or other electronic means to obtain claims data in bulk from them. SSA currently has some limited processes in place to allow third party professionals to assist claimants in filing electronic disability reports (the i3368PRO) and submitting medical evidence (Electronic Records Express) in support of their claims for disability benefits, but these must be accessed one claim at a time. SSA is interested in expanding the relationship with third parties by allowing the submission of claims-related data to SSA in bulk. SSA would like to leverage the data that third parties may already have in their records, without requiring the labor-intensive process of keying information into a web interface one claim at a time. There is a need for an automated way to get large volumes of data from the third party’s electronic data store into SSA’s legacy systems, to enable us to process claims to completion, while still maintaining the integrity of the data. The long term vision for this project is to eventually collect data for Title II and Title XVI initial claims and appeals, including required disability reports, available medical evidence and any other relevant data a third party may have. The premise is that the data, once uploaded to SSA, would be funneled to the appropriate SSA legacy systems for processing. Respondents should address the following questions and are invited to provide any additional comments relevant to the subject of bulk data transfer. Responding to as many questions as possible will allow us to perform a comprehensive analysis of the feasibility of this concept. Please identify by Heading / Number each question to which you are responding. 2 Currency - How current is the data you maintain? How often is it updated? 3 Volumes – For how many individuals do you have Social Security claims-related data? 4 How many individuals do you expect to assist with filing a claim for SSA benefits this year? Do you expect this number to grow, shrink, or remain relatively unchanged in the next 3 years; next 5 years? 5 Access - Can the data be changed/modified once collected and if so, by whom? 6 Do you collect evidence or copies of evidence, such as birth certificates? How is the evidence stored? What is the source of the evidence? 7 How do you verify the identity of the person providing the data/evidence? 8 How do you record an individual’s agreement with the information in your records? 9 If you update the data or otherwise change it, do you obtain the subject’s agreement with the changed data? 10 If yes, how do you document these agreements? 11 Are these agreements stored? a) What is the format of the interview? c) Is there any review for accuracy, completeness, consistency? d) Is there any verification of data through other sources? Provide copies of any forms used. 14 Do you record the method of collection if more than one method is used? 15 Do you require consent from individuals to share personal data? 16 How do you document consent and maintain this documentation? 17 Do you collect data for any other purposes? 18 Do you exchange data with any other government (federal, state, local) agencies? Which agencies? 19 If you exchange bulk data with other agencies, what is the process? 20 Do you use any commercial software to collect data or transfer data to other agencies? 21 If you already submit claims for Social Security benefits or supporting information for claims, how many do you submit per year? 22 What methods do you use, or have you used, to provide data to SSA in the past? If you produce SSA forms, which forms do you produce (e.g. SSA-1, SSA-16, SSA-8000, SSA-3368, SSA-3441, SSA-827, SSA-821, SSA-1696, etc.)? 23 Do you currently have any processes or interfaces with any Social Security field offices in place (formal or informal)? If so, describe in full, including how you exchange or transfer information to SSA; provide the name, office address and phone number of your current SSA contacts. 24 Do you have a preferred method of providing bulk electronic claims-related data (i.e on more than one individual at a time) to SSA? 25 If there was information, needed by Social Security to file a claim for benefits that you do not already have, would you be willing to collect it? 26 Please provide any further information you consider relevant to the subject of bulk electronic data submission to SSA. 27 What is the format of the data you store? 28 How is your data stored? 29 Who has access to the data you collect? We encourage those third parties who respond to provide SSA with as much information as possible about the kind and amount of data they can provide, and how they envision the data transmission process. We appreciate your efforts on this important initiative. Please include a name and phone number of whom to contact in the event there are questions regarding your submission. Note: This is not a Request for Proposals. A contract will not be awarded based on submissions. We are writing to express our deep concern about your recent statements that you remain committed to privatizing Social Security and will make privatization a top priority after this year's congressional elections. We understand that you and most Republicans genuinely believe in privatization and remain strongly committed to pursuing this approach. However, we want to make clear that Democrats are just as adamantly opposed to privatization and remain strongly committed to defeating this seriously misguided proposal. We believe the American people are on our side in this debate, and for good reason. Cutting Social Security's funding by diverting payroll taxes into privatized accounts, as you have proposed, would require deep cuts in guaranteed benefits and lead to a massive increase in borrowing. This would weaken Social Security, not strengthen it. The resulting benefit cuts would harm all seniors in the future, even those who prefer not to open a privatized account. Meanwhile, the massive new federal borrowing would weaken our economy, saddle future generations of Americans with trillions of additional debt and increase our economic dependence on China, Japan and other foreign nations. Our country faces serious economic problems, including a tightening squeeze on the middle class, rising prices for gas, health care and college and a troubling long-term budget shortfall. We want to work with you on a bipartisan basis to address these challenges. However, we would strongly resist the privatization of Social Security, which would only make our fiscal problems worse and jeopardize Americans' retirement security. Therefore, as you develop your agenda for the post- election period, we strongly urge you to reject privatization and instead focus on bipartisan solutions to the most serious problems facing our nation. The Government Accountability Office (GAO) has issued a report on different ways that Social Security benefits might be indexed for inflation. Basically, the report concerns the possibility of using a different formula that would reduce cost of living adjustments of current or future beneficiaries in order to save money. This report is a sign of the continued interest of Republicans in the Congress and the Executive Branch in reducing Social Security expenditures. 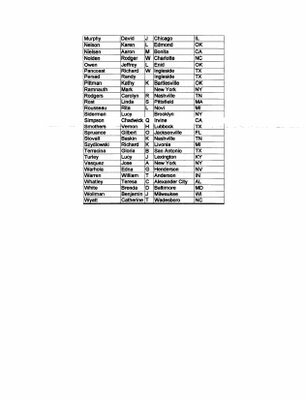 Below is a list provided by Newsmeat of the political contributions of Michael Astrue, President Bush's nominee to become the next Social Security Commissioner. This list may not be complete and it certainly looks like it is not up to date. However, if it is anything like accurate, Mr. Astrue has not been an easy touch for campaign funds. ATLANTA, GA (September 13, 2006) - Social Security’s Internet site, www.socialsecurity.gov , is among the most popular of government websites. In fact, in a survey conducted by the American Customer Satisfaction Index, four of the top five services evaluated are located on Social Security’s website. Our Social Security Benefits Application was number one, followed by the Application for Extra Help Medicare Prescription Drug Plan Costs page and the Social Security Business Services Online page. In fifth place was the Social Security Retirement Planner. It is perhaps a minor matter, but this is an example of a Social Security press release that Social Security chooses not to post on its own website that is supposed to show its press releases. There have been a number of these lately. If the best that Social Security's press office can do is to get a press release like this published in a tiny local news media, it is hardly worth the effort of even doing the press release in the first place. One would think that Social Security would at least post these press releases online so that those few who are genuinely interested in what the agency is doing would be able to find them more easily. Mark Warshawsky, one of President Bush's other appointees to the Social Security Advisory Board, has worked at the Department of the Treasury. He campaigned publically for President Bush's plan to privatize Social Security, as this press release from 2005 shows. Will the Social Security system founder as millions of baby boomers enter their retirement years? Is the frightening vision of an impoverished old age a glimpse into the real future for Americans of the next generation? The authors of this book put debates about Social Security reform into historical perspective, consider various reform ideas, and elaborate a proposal to ensure that the system can continue to meet the claims of the retired and disabled. Sylvester J. Schieber and John B. Shoven, leading experts on retirement issues, set forth a carefully considered plan to change the way we finance Social Security and thereby secure its future viability. Exploring the history of the Social Security system from its origins during the Depression to its current troubled prospects, Schieber and Shoven analyze the program's economic structure and introduce the remarkable personalities who influenced its evolution. The authors show how Social Security today differs from the program Franklin D. Roosevelt envisioned an how the shift to pay-as-you-go funding has led to the systems current problems. Seen in historical context, some reform approaches are revealed as a renewal of attempts to fund Social Security through means that have repeatedly failed. The authors a true mandatory private retirement savings account. For workers -- a proposal that would lighten retirement-security burdens for future generations, avoid tax increases, and preserve the system's progressivity. This book is essential reading not only for policymakers but for anyone else who wishes to understand what Social Security reform will mean for us as a nation and as individuals. The President intends to designate Sylvester J. Schieber, of Maryland, to be Chairman of the Social Security Advisory Board for the remainder of a four year term expiring 01/21/09. Mark J. Warshawsky, of Maryland, for the remainder of a six year term expiring September 30, 2012. Dana K. Bilyeu, of Nevada, for the remainder of a six year term expiring September 30, 2010. David Walker, the Comptroller General, has commended Social Security for its effective response to Hurricane Katrina. Walker indicates that while many other agencies failed, SSA excelled. Michael Astrue, President Bush's nominee for Commissioner of Social Security, has a significant affiliation with the Washington Legal Foundation. He is listed on the list of speakers that they make available. Washington Legal Foundation is a right wing organization that provides pro bono legal representation. With Astrue being affiliated with the Federalist Society and the Washington Legal Foundation, there can be no doubt that he can be accurately described as a "movement conservative." Although I can find no record of Astrue every saying this, it would be surprising if Astrue did not share the "movement conservative" view that Social Security is evil and should be abolished. Knowing if you do well, you can help bring breakthrough drugs to desperate patients. Challenges: High risk, stress and uncertainty; excessive litigiousness in industry. Integration of science, law and business considerations; strong stomach. Generally, it is best to start with a law firm and then move to a medium sized or bigger company if you want to work in biotech. Most importantly, though, forget about long-term plans and just try to do something immediately worthwhile. Mostly government service (many years at HHS, including 3 ½ as General Counsel) then General Counsel at Biogen. Mentors: C. Boyden Gray, Kenneth Novack; Influences: James Q. Wilson, Ronald Reagan, Laura Mali-Astrue [apparently his wife, a French teacher]. Hutt & Merrill: Food and Drug Law. Just sitting around at home and the phone rang. Council Member: American Bar Association Section of Administrative Law; Vice Chairman: Federalist Society Section of Administrative Law. First day working in The White House, 1988. Cuttyhunk Island; New Formalist poetry; the music of Richard Thompson. 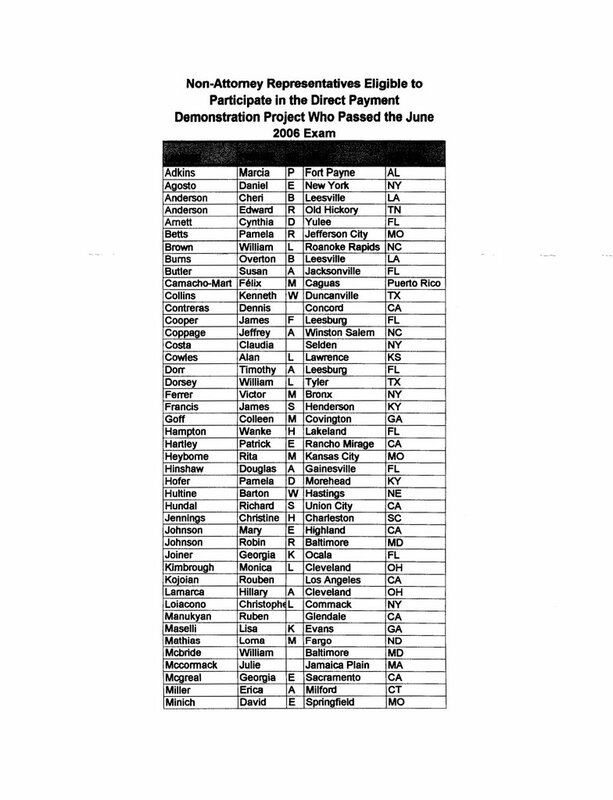 Above is a list of those who passed the third examination given to non-attorneys who represent claimants before the Social Security Administration. Those who pass are given the privilege of having their fees withheld by Social Security. I will have the results transcribed, but wanted to make it available as quickly as possible for those who have truly excellent vision or who can find a way to have their computers magnify the images. This was obtained by Freedom of Information Act request. There are good doctors and mediocre doctors. But according to the U.S. SEC, Dr. Richard Selden is in a class by himself. Selden, the former chief executive of Transkaryotic Therapies (TKT) [where Michael Astrue, the nominee to become Commissioner of Social Security, used to work], was charged by the SEC with allegedly hoodwinking investors about failed drug trials to artificially inflate the stock price--then selling off his own shares. According to the civil complaint filed Thursday by the SEC, Selden sent positive press releases even after the U.S. Food and Drug Administration had said in 2001 that trials of TKT's company's flagship drug Replagal, had failed. By selling his shares before disclosing the negative data about Replagal, Selden "unjustly enriched" himself by $1.66 million, the SEC alleged in the complaint filed in U.S. District Court in Boston. The agency is seeking that money along with the $1.1 million in salary and bonuses Selden earned in 2001 and 2002. According to an Associated Press report, Selden in 2001 sold 90,000 shares of TKT stock--well before Oct. 3, 2002, when TKT finally disclosed the problems with its FDA application. The next day, its shares plunged 61%, to $12.75. Through his attorney Thomas J. Dougherty, Selden maintained TKT lawyers, who advised him wrongly, bore responsibility for his actions. "He deserves and expects to prevail at any trial of the issues," Dougherty told The Boston Globe. Who were these TKT lawyers whom Dr. Selden alleges advised him wrongly? Michael Astrue was TKT's Legal Counsel at the time, so he is almost certainly one of them. On the face of it, we have a simple situation. Astrue was the chief legal officer at TKT. He was responsible for making sure that the company stayed in compliance with SEC rules. His CEO apparently violated SEC rules in a spectacular way that nearly destroys the company. Why did Astrue not prevent this? Is he in some way culpable for what happened? Exactly what Dr. Selden did, when he did it and why are probably much more murky than this article indicates. If it were this simple, Selden would probably be facing criminal charges. Of course, Selden is trying to save his own skin and may say anything, so we should not take his statements too seriously. No one other than Selden is accusing Astrue of doing anything improper. Maybe other attorneys within TKT or at an outside law firm were advising Selden on SEC matters. For all we know, the key incidents in this case happened suddenly without Astrue's prior knowlege. Perhaps, Astrue bluntly warned Selden and the TKT board of directors about what was happening and they ignored him. We do know that TKT's board of directors selected Astrue to replace Dr. Selden as CEO after this happened, which strongly suggests that they did not blame Astrue for what happened. Astrue was selected for several boards of directors and became an interim CEO after this happened. All of this suggests that within the Boston biotech community that Astrue was not blamed for what happened. Despite all of the signs that no one other than Dr. Selden blames Astrue for what happened, it remains a fact that what appears to have been a preventable legal problem happened on Astrue's watch and that the legal problem nearly destroyed his company. The legal problem has certainly destroyed the career of the CEO who was Astrue's primary client. The SEC charges against Dr. Selden have not been resolved, as best I can tell, meaning that this matter could come back to haunt Astrue. The FBI must have investigated Astrue before this nomination was announced. Astrue's role in the Selden debacle had to have come up during the investigation, so the Senators considering Astrue's nomination should have access to much more information about this matter than is available on the public record. There are legitimate questions to ask Michael Astrue about what happened at TKT. That there may be good answers for these questions is no reason not to ask them. 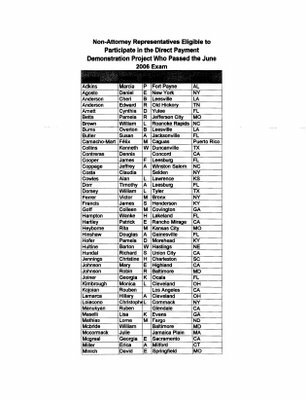 2001 Name floated as possible appointment to head Food and Drug Administration -- Never formally nominated due to opposition of Senator Edward Kennedy and six other Democratic Senators who did not like Astrue's close association with the pharmaceutical industry. Astrue later quoted as saying "Ted [Kennedy] never said it was anything personal ..."
Board of Directors, Tercica August 2005 to date? Board of Directors ArQule April 8, 2005 to date? There is virtually no personal information available on the internet about Astrue. Some years ago it was mentioned that he was married and had one child. Apparently, he is known for preferring informal clothing. The country had a big debate last year about Social Security, and the American people made their views plain: they do not support the President’s proposals to privatize Social Security and to deeply cut benefits. As he moves through the nomination process, I hope that Michael Astrue will be responsive to the Americans he wishes to serve. He should commit to maintaining the critical role that the Social Security program currently plays in providing income security for retirees, disabled workers, survivors, and their families. He will also need a plan to speed and improve service to the public, particularly those applying for disability benefits. I look forward to learning more about Mr. Astrue and his views on managing the Social Security Administration. I will also add that Current Commissioner Jo Anne Barnhart has done a good job leading this important agency in difficult times. Her dedication and expertise will be missed when she leaves, and she has my appreciation for her service. This can be read to mean that Baucus will oppose Astrue's nomination unless Astrue repudiates President Bush's plans to privatize Social Security, or at least pledges not to try to advance it. There is a big reason why Astrue's nomination may fail anyway. If confirmed Astrue will serve throughout the term of the next president. Democrats in the Senate may prefer to prevent anyone from being confirmed rather than forcing the next president, who may be a Democrat, from having to cope with a Social Security Commissioner chosen by President Bush. Michael Astrue's nomination to be Commissioner of Social Security has been almost completely ignored by traditional news media. Neither the New York Times, nor the Washington Post, nor even the Baltimore Sun has an article on this development. The Associated Press and Reuters have not carried this information. The Social Security Administration has almost 60,000 employees and pays benefits to almost one American in five, but the appointment of a new head for the agency is not worthy of even a brief article, even in Baltimore, where Social Security has its headquarters. Social Security may be the largest employer in Baltimore, but the major Baltimore newspaper did not even notice the appointment of a new head for the agency. CMS And SSA Heads Bite Dust In One Week -- Coincidence? Members of the Senate Finance Committee are keeping the pressure on the Medicare and Social Security agencies to fix a glitch that caused hundreds of thousands of beneficiaries to pay the wrong premiums. The heads of both agencies met with the Finance Committee behind closed doors last week to go over their plans to rectify billing discrepancies that led to many Medicare enrollees owing unpaid premiums to the health-insurance companies providing their drug benefits. Since meeting with Centers for Medicare and Medicaid Services (CMS) Administrator Mark McClellan and Social Security Administration (SSA) Commissioner JoAnne Barnhart last Thursday, several senators have expressed concern that the plans from agencies might be too harsh, especially for poorer beneficiaries. These billing errors have brought renewed attention to the pitfalls inherent in rolling out the massive new Part D prescription-drug benefit, which has required the coordination of federal agencies and health insurers. The administration has disclosed two separate billing problems in recent weeks that together affected an estimated 700,000 Medicare beneficiaries. First, the administration revealed that 230,000 beneficiaries were accidentally sent refund checks that would have to be returned or repaid. Later, the administration said that the wrong Medicare premiums had been deducted from Social Security checks sent to 400,000 to 500,000 beneficiaries throughout the year, and that in some cases no premiums at all had been paid for months. The health plans that administer the drug benefit likewise have not been paid the premiums that CMS and the SSA should have been collecting and passing along. These health plans also will ultimately be responsible for recouping unpaid premiums. Earlier this week, Mark McClelland, the CMS Director, resigned. Now a replacement is named for Jo Anne Barnhart, the Commissioner of Social Security, with almost four months left on her term. All of this happens within a week at a time when frustration with the poor implementation of the Medicare prescription drug benefit is at its peak. Coincidence? While it may be obvious to those familiar with Social Security that the Medicare prescription drug benefit problems lie almost completely with CMS, this may not be at all obvious to Congress and the White House. Perhaps it was already clear that Barnhart was not going to be reappointed and this was merely a question of timing, but there is a strong possibility that Medicare Part D has something to do with what happened this week to McClelland and Barnhart. On Jan. 28, with considerable effort, Michael J. Astrue shaved and put on a tie. It was the first time he had attempted either task in 11 days. Astrue, the former general counsel at Transkaryotic Therapies Inc. of Cambridge, hadn't been taking his legendary casual-dress philosophy to an extreme. On Jan. 17, he had slipped on the ice while walking from his front door to his car. His left arm was pinned beneath him and he fractured his elbow. But Astrue had a reason to make himself presentable: There was a reception that afternoon for people who had served on Governor-elect Mitt Romney's transition team. Moreover, just that morning he had received an invitation to attend a board meeting at TKT's Main Street headquarters. Astrue had resigned from the firm just five weeks earlier. The directors wanted to hear his advice for righting TKT, a 15-year-old biotech firm that had just suffered a series of severe regulatory setbacks that had crushed the near-term prospects for the company's Replagal drug and in four months slashed TKT's share price by 85 percent. Astrue was planning to spend the new year doing research at the Hudson Institute, a conservative think tank based in Indianapolis, and teaching at the Boston University School of Law, while he sought an appointment somewhere in the Bush administration. But he accepted the invitation to meet the directors for two reasons. In just a few years, Astrue has become one of the more influential players in Massachusetts' biotechnology industry. After serving as associate counsel to the president, he was general counsel for the Department of Health and Human Services, overseeing an army of hundreds of lawyers. He later was a partner at Mintz Levin Cohn Ferris Glovsky and Popeo PC of Boston, and served as general counsel for Biogen, the Cambridge biotech giant, starting in 1993. He left Biogen for TKT in 2000, and was chairman of the Massachusetts Biotechnology Council in 2001. For Astrue, the return to TKT is more than just another serendipitous career move. After nearly 20 years spent in supporting roles - overseeing law departments, advising chief executives, handling patent litigation - Astrue is finally the leading man. If he achieves success running TKT, it is likely to be the defining episode of what has already been a high-profile career in the biotechnology industry. It is abundantly clear that Astrue has his work cut out for him. Next month, the company will announce a major layoff affecting about 100 employees, or more than 20 percent of its work force. Major changes are also forthcoming in TKT's senior management, according to a former TKT executive. The President intends to nominate Michael J. Astrue, of Massachusetts, to be Commissioner of Social Security, for a six year term beginning January 20, 2007. Mr. Astrue previously served as Chief Executive Officer of Transkaryotic Therapies. Earlier in his career, he served as General Counsel at the U.S. Department of Health and Human Services. Previously, he served as Counselor to the Commissioner of Social Security at the U.S. Department of Health and Human Services. He also served as Acting Deputy Assistant Secretary for Legislation at the Department of Health and Human Services. Mr. Astrue received his bachelor's degree from Yale University and his JD from Harvard University. Social Security's Disability Service Improvement (DSI) plan may be in serious trouble. The statement below is an anonymous report from the ALJ Improvement Board, supposedly quoting from some communication received from the National Treasury Employees Union. DSI is underway. Last month training began in Falls Church for the new FedROs. Management has not released much information about the new FedROs but it appears that the Agency was only able to find about 30 (it wanted 70) individuals willing to accept their offer of appointment to the FedRO position in Falls Church. In response to our request for information, the Agency reported that 11 ODAR hearing office GS-12 attorneys accepted the FedRO appointment, but not one single GS-13. I do not know whether that is because no GS-13 accepted an offer or if no offers were made. About 20 agency attorneys have opted to become FedROs and five management personnel have accepted the GS-15 supervisor position. Additionally, about 10 attorneys were hired from the outside. If true, DSI is in very, very serious trouble and may fail before it even has a chance to get off the ground. The Federal Reviewing (FedRO) job is the centerpiece of DSI. If Social Security is unable to hire enough FedROs the plan cannot possibly be implemented even in Social Security's small Boston Region. Why might Social Security have trouble hiring Federal Reviewing Officers? The answer is fairly simple -- fear that the program will not last after Jo Anne Barnhart's term as Social Security Commissioner ends in January 2007. If DSI ends after Barnhart leaves SSA, the career of anyone hired as a FedRO may be in jeopardy. Many federal employees are attracted to government employment by the promise of extremely stable employment. Federal employees are on average vastly more frightened of any danger of becoming unemployed than their counterparts in private employment. Few Social Security employees are going to be willing to move to the Washington-Baltimore area to take a job if there is any threat that the job will not last. Can any Social Security employee in a position to know confirm this report on the ALJ Improvement Board? You may e-mail me at charles[@]charleshallfirm.com. Social Security has published a new directive in its Program Operations Manual Series (POMS) to protect the privacy of Social Security claimants. The directive requires certain identity proof from persons acting on behalf of a claimant, primarily attorneys and representative payees, before information may be given out over the telephone. As a practical matter this requires the attorney or representative payee to know the date of birth, place of birth and mother's maiden name of a claimant. The Washington Post reports that President Bush plans to make another attempt at Social Security "reform" after this November's election. He hopes to be able to "drain the politics out of the issue." The Social Security Administration would be forced to send employees home without pay and shut offices 10 days next year if Congress does not increase its funding in fiscal 2007, the agency has told Congress. "Fewer resources mean fewer people to serve the public in all areas of SSA's operations," Jo Anne B. Barnhart , the Social Security commissioner, said in a letter to the Senate Appropriations Committee. "Because these budget reductions will affect all employees, they will result in major service disruptions across all workloads." "For an agency like ours, it is kind of a shock," said Richard Warsinskey , president of the National Council of Social Security Management Associations. Warsinskey said he understands that companies lay off and furlough employees in bad economic times, "but this is a public service issue." He said, "We don't want to take a well-run agency and make it mediocre because we don't get enough money." Mark Lassiter , the Social Security press officer, said no decisions on furloughs have been made. The House and Senate have not finished work on the agency's budget and Barnhart "remains hopeful that the president's budget request will be approved by Congress," he said. The Senate bill would provide about $9 billion for the agency -- about $400 million less than the president's request and about $54 million less than what the agency received for this year's budget. The House proposal would leave Social Security about $200 million short of what the White House is seeking. The agency's budget may not be resolved until after the November elections, congressional aides said. A spokeswoman for the Senate Appropriations Committee said House and Senate negotiators would review the agency's funding and staffing levels later this year. Many agencies are likely to face budget squeezes next year, in part because Congress faces tough decisions on financing the Iraq war and homeland security. Social Security, headquartered in Baltimore, has about 65,000 employees, and officials estimate that more than 40 percent of its workforce will retire by 2014. It appears that not all departing employees will be replaced because of budget pressures. Only one employee is being hired for every three that depart, according to 2006 and 2007 budget plans. WREG-TV reports that Arthur Boutiette, the director of Arkansas Disability Determination Services which makes decisions on Social Security disability claims, has been drawing a salary of $110,197 a year, even though the maximum salary for his job is supposed to be $89,923. The higher salary was achieved by paying Boutiette as a medical consultant, even though he is not any sort of medical consultant. § 401.100 Disclosure of records with thewritten consent of the subject of the record. (a) General. Except as permitted by the Privacy Act and the regulations in this chapter, or when required by the FOIA, we will not disclose your records without your written consent. (b) Disclosure with written consent. The written consent must clearly specify to whom the information may be disclosed, the information you want us to disclose (e.g., social security number, date and place of birth, monthly Social Security benefit amount, date of entitlement), and, where applicable, during which time frame the information may be disclosed (e.g., during the school year, while the subject individual is out of the country, whenever the subject individual i receiving specific services). (c) Disclosure of the entire record. We will not disclose your entire record. For example, we will not honor a blanket consent for all information in a system of records or any other record consisting of a variety of data elements. We will disclose only the information you specify in the consent. We will verify your identity and where applicable (e.g., where you consent to disclosure of a record to a specific individual), the identity of the individual to whom the record is to be disclosed. (d) A parent or guardian of a minor is not authorized to give written consent to a disclosure of a minor’s medical record. See § 401.55 (c)(2) for the procedures for disclosure of or access to medical records of minors. If applied too literally, this could make the job of an attorney representing a Social Security disability claimant more difficult, since the mere appointment of the representative would not be enough to authorize the attorney access to the client's records at Social Security. A separate, detailed authorization would be required for each disclosure. It is unlikely that this was intended. This is only a proposal. The public can comment on the proposal until November 13, 2006. Lump Sum Veterans' Disability Benefits?